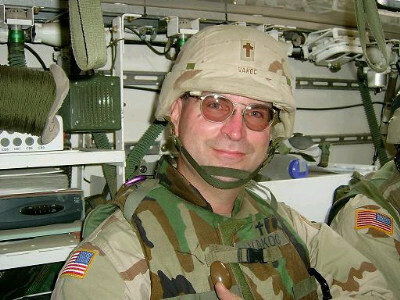 Father Tim Vakoc became an Army chaplain in 1996 and served in Germany and Bosnia before being sent to Iraq in 2003. He traveled widely in Iraq, as he was committed to celebrating mass for all military personnel wherever they were. On May 29, 2004, as he was returning to Mosul from a mass in the field, he was severely injured by a roadside bomb. The date was also the 12th anniversary of his ordination. Vakoc was evacuated to Baghdad, then to Germany, then to Walter Reed Hospital in the U.S. He was paralyzed and sustained brain damage. A Purple Heart was expedited and awarded to Vakoc. The priest was in a coma for six months and was transferred to an assisted living care facility, where he began to show signs of improvement in 2005. Vakoc was given a computer which he used for limited communication, and even began to speak in 2007. Father Vakoc died on June 20th, 2009. In addition to the Purple Heart, Vakoc was awarded the Bronze Star and the Combat Action Badge. Text from the U.S. Army Chaplain Corps Facebook page; photo from the Knights of Columbus Fourth Degree website.